Villa Pandolfini 2 is a vacation rental accommodation in Tuscany near Florence, Italy with extensive views of Arno Valley in a beautiful town close to the historical city of Florence. 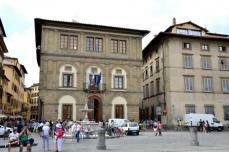 This noble elegant building dates to the 14th century and is situated on the hills of Florence. Surrounded by vineyards and olive-groves this elegnant accommodation villa has been completely restored in the full respect of the formal original antique structure but equipped by all modern comfortable conveniences. High quality furnishing, carpets, paintings and valuable objects decorating the spacious and light-filled rooms create its peculiar atmosphere of warmth and grace. 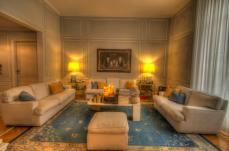 Villa Pandolfini 2 is a spacious historic villa apartment dating back to the 14th century. It is characterised by high ceilings, frescoes, beams and marble throughout. The apartment is split into two levels - at the garden level floor there are 2 bedrooms one king size large bedroom and a second bedroom split with a loft style. There is one double bed down and another one up. It has a private bathroom with shower over tub, toilet & bidet. There is another wc on this floor. There is a large living room downstairs with comfortable seating and a tv, a fully equipped kitchen made of marble and is well-stocked with all kinds of crockery and cutlery that the guests may require. The fully equipped kitchen has a dining area. This level has two bathrooms - both of them have showers, toilets and one of them has a bidet. Through the entrance, from this level guests have access to the spacious parking space in front of the main villa. Guests are also free to use the private garden area and a breathtaking loggia and furniture for alfresco dining. The estate on which this villa is located is a sprawling 110 hectares. There are lovely woods to explore with a 2.8 km marked trail. There is a nice shared pool and guests can also enjoy horse riding on the estate next door. All utilities and services are at a walkable distance. At 5 mins, there is a bank with atm, a butcher, a few of cafe/bars, some stores for groceries, a pharmacy, bakery, and a couple of restaurant/pizzerias. Then within a 10 min walk you will find another little town with more stores and a great steak trattoria. Locally within 20 mins drive there are also numerous very good restaurants. For those that do not have a car this location gives you the benefit of the country , towns but is served with 2 local train stations so to explore pisa or florence you can reach the station in 10minutes by foot and then the ride to florence is 15mins approx and trains run all day till after midnight. 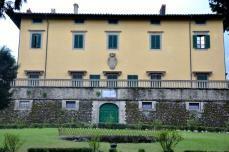 Tuscan cooking classes are also available on the estate and to renters of this property you will get a 10% off.